Indian papaya recipes, healthy papaya recipes. papaya Papaya is a fleshy, musky fruit with a smooth orangish-green skin and an orange flesh. It has a musky and delicate sweet taste which is not overly sweet. The inside of the fruit is hollow and contains many seeds which are to be removed prior to eating. A ripe papaya can be eaten raw without the skin while an unripe one can be cooked. Papaya, once considered to be exotic, is not found all year round in many parts of the world. Papayas are a great source of antioxidants, vitamin C and flavonoids and hence it makes sense to incorporate them in our diet. Instead of eating them plain, you can combine them with other fruits in a Fruit chaat and zing it up with a little chaat masala for extra taste. This way you get the goodness of many fruits together. A papaya-based juice, Golden Glow, is enhanced with a mild touch of honey, which not only sweetens the juice but also helps to highlight the positives of papaya. Another healthy papaya juice is a Tomato Orange Carrot and Papaya juice which is infused with vitamins A, C and digestive enzymes. The plain papaya, without any addition, is enough for snacking is it tastes delicious and helps in relieving constipation too. Combine papaya, cucumber and capsicum to make a delicious fruit and vegetable salads with an apple dressing. The amazing thing about this salad is that you get all these different textures together that satisfy your hunger, it is healthy and it is tossed in a unique dressing made with apples. Both pear and papaya are easily available fruits, so combining them together to make a Papaya pear and yogurt smoothie is always a great idea. Curd gives the smoothie a nice tang and the addition of sunflower seeds gives it a new texture. Click here to know more reasons to eat papaya! 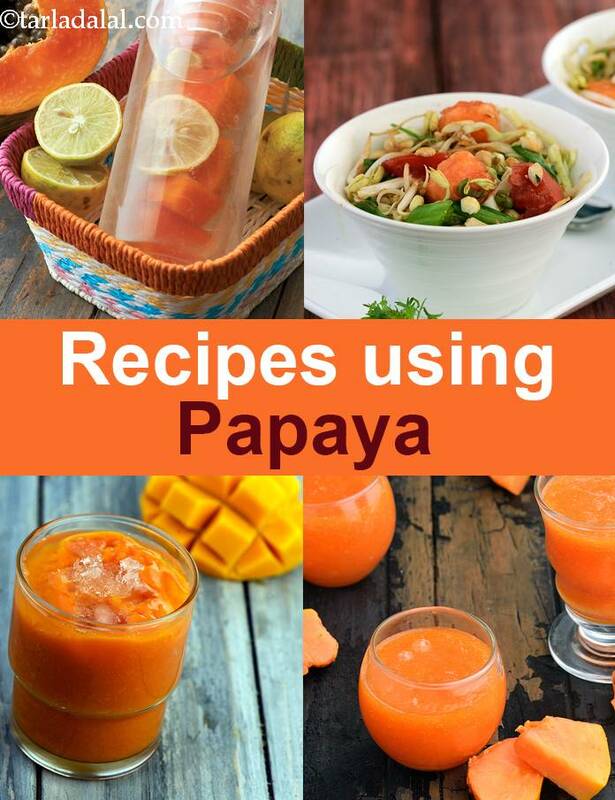 Enjoy our Indian papaya recipes, healthy papaya recipes given below. Vitamin A rich papaya and melon scoops tossed together in an unusual zinc rich honey ginger dressing to enhance your immunity. Surprise your kid with this unusual combination of papaya and pineapple! let the little one explore the tangy taste even while topping up on varied nutrients and fibre! A glass of this juice provides 4 gm of fibre, which aids in digestion. Tangy and crunchy pineapple and sweet and soft papaya might sound contrasting, but they are a perfect combination for a delicious smoothie! adjust the sugar according to the sweetness of the fruits picked by you for the pineapple papaya smoothie. This snazzy orange coloured-carbohydrate rich juice is a fulfilling breakfast idea. The papaya being alkaline by nature prevents acidity and the lemon juice makes it more interesting by imparting its flavourful touch. The specialty of smoothies is that the strangest of ingredients combine well to give great results! you might never have thought of combining papayas and muskmelons, but try the papaya melon smoothie and you are sure to fall in love with this combination.